Corbin Gwaltney '43 changed the whole field of alumni magazine publishing with his vision for a magazine that would provide a source of continuing education. 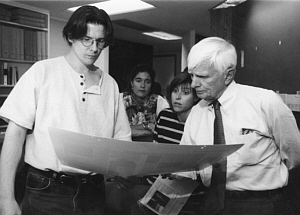 Gwaltney (right) at work at The Chronicle of Higher Education, which he helped launch in 1966. "A Model of Lively Thought"
He was taking a gamble, but Corbin Gwaltney '43 was convinced it would pay off. So the 28-year-old withdrew the last $100 from his savings account, bought some photographs of Johns Hopkins buildings, and hired a calligrapher to pen "Johns Hopkins Magazine." It would become the nameplate for the front cover of the magazine "dummy" he was creating. The year was 1949 and Gwaltney had a vision for a new kind of university magazine. A magazine that would serve up substantive stories about the people and the work at Johns Hopkins, with Life-quality photography. A magazine that would be a source of continuing education for alumni, rather than simply a repository of class notes, fundraising pitches, and campus news. But before he could publish the first issue, he had to sell the idea to the university's powers-that-be. So Gwaltney put together the dummy. In it, he included the idea for a photo-laden story on the university's Chesapeake Bay Institute, as well as an article on Hopkins's foray into television with the weekly Johns Hopkins Science Review program. Provost P. Stewart Macaulay, a former newspaperman, and others liked what they saw, so they gave their alumnus carte blanche-- and about $40,000 in annual funding, as Gwaltney remembers it--to produce nine issues a year. Gwaltney set to work with new assistant editor Ellen Watson, a recent Wellesley grad who'd done reporting for the Baltimore Sun. Six months later, in April 1950, the first issue of Johns Hopkins Magazine landed in the mailboxes of the university's alumni. As Gwaltney remembers it today, "President [Detlev] Bronk was absolutely livid. He hated it." Bronk, it turns out, had envisioned a magazine more along the lines of the MIT Technology Review--highly technical and seriously scientific. Macaulay and others on the Magazine's editorial board successfully convinced Bronk to give the fledgling magazine a chance. Bronk did, and one year later, it was named the 1951 Robert Sibley Magazine of the Year--the best college or university magazine in the country. During Gwaltney's decade as editor, the Magazine would be similarly honored twice more, in 1956 and 1959. The Johns Hopkins Magazine "changed the whole alumni publishing field, as one after another young editor, mentored largely by Corbin, would take over alumni publications" and implement a similar philosophy, says Ron Wolk, who joined the Hopkins Magazine staff in 1958. Wolk remembers taking the job with some misgivings, thinking: What am I doing at an alumni magazine? I want to edit LIFE or Look. His attitude softened after a summer spent combing the Magazine's files. "There were letters in there from some of the country's greatest photographers and editors, complimenting the Johns Hopkins Magazine," he recalls. "Corbin had really attracted attention in the commercial publishing world. I realized, somewhat belatedly, that I had joined a pioneering magazine." A TIME article would later praise Gwaltney for creating "a model of lively thought," while Newsweek wrote approvingly of the Magazine's "cerebral qualities." SHOW, the Magazine of the Arts, wrote, "Both the photographs and text are of a quality that many consumer magazines might well envy." Gwaltney hired photographers like Werner Wolff, Robert Mottar, and Erich Hartmann from big-league photo studios like Black Star and Magna. For $100 a day plus expenses, they would take the train from New York to Baltimore's Penn Station. Then Gwaltney whisked them off to campus to shoot portraits of visiting poets like Robert Frost and e.e. cummings, or to the Hopkins Hospital operating room to document pioneering eye surgery in breathtaking detail. Watson, who remained at the Magazine until 1954, remembers spending hours with Gwaltney laying out the Magazine's pages. They'd move shapes (which represented photos) around on a page, first this way, then that. More often than not, they'd come back the next day, tear up what they'd done, and start over. The idea of running large, close-up photos, and "bleeding" them out to the edge of the page, á la LIFE magazine, was a "radical" departure from the "grip-and-grin" snapshots that appeared in so many alumni magazines at that time, Watson recalls. The Johns Hopkins Magazine in its first decade was published monthly throughout the academic year--October through June--with a full-time staff of just two. Gwaltney and Watson tackled much of the writing themselves. The task they set for themselves, of writing about the specialized work going on at Hopkins in a compelling way that would be fathomable to the educated layperson, "was all virgin territory," Watson recalls. Headquarters for the tiny staff was a small room in the Greenhouse, the campus's original botanical lab that sits adjacent to the President's House. Loath to spend a nickel out of his precious budget on office supplies, Gwaltney himself took charge of laying the office's asphalt floor tile; he also built his own desks, copying a design by Florence Knoll. The room's Bunsen burners, vestiges of its former incarnation as a lab, Gwaltney recalls, "were very handy for starting the morning coffee." Working in a greenhouse had its advantages, as Gwaltney pointed out to readers in a 1955 Editor's Note. "Even in mid-February, you can get up from your typewriter and escape in a matter of three steps. You can put yourself in the midst of flowering azalea bushes, or take a whiff of the chocolate orchids (which smell like a candy store)." The downside was the room's excessive humidity, which quickly took its toll on his hand-crafted desks: "We arrived one morning to find that our office furniture had collapsed, its glue evidently weakened by the moisture-laden air that billows into our cubicle when the plants are watered; and after a couple of futile attempts at repair, we gave up the job. Now it is principally gravity (good old gravity) that holds our furniture together, and visitors to our office who once lean against a desk are never likely to do so again. They, and the desk, are apt to land in a crashing heap on the floor." Gwaltney made it clear from the beginning that the Magazine would report honestly on the university. "I really truly loved Hopkins very much," he says, "yet I tried to approach it as a journalist would, always asking the hard question." As a mentor to other young alumni magazine editors, he argued the virtues of editorial independence, contending that editors should be given the same sort of academic freedom afforded to university professors. Gwaltney's convictions were put to the test midway through his tenure at Hopkins, when the Magazine was moved out of the Provost's Office to report to Development. Gwaltney staged what he today describes as "a little strike." The move was quickly rescinded. In 1957, the 35-year-old "dean" of alumni magazine publishing got together in New York with editors from 10 other colleges and universities. The group wanted to collaborate on an editorial project that would examine issues in higher education, allowing them, in Gwaltney's words, "to place our own institutions in some kind of perspective." The meeting took place on the same day that the first Sputnik circled the Earth. 'They're shooting for the moon," noted one of the editors. Gwaltney responded, "So are we." Thus, the Moonshooter project was born. Each editor pledged 60 percent of one issue of his or her magazine to fund the supplement. Almost on a whim they offered the first one, "American Higher Education, 1958," to editors at other universities as well, at five cents a copy. Gwaltney says they were amazed to sell 1.35 million copies to 15 colleges and universities in the U.S., Canada, and Mexico. By the project's third year, circulation surpassed 3 million. The workload for Gwaltney mushroomed to the point that it was impossible to do both jobs. So in 1959, he left Johns Hopkins Magazine to become the first full-time employee of the fledgling Editorial Projects for Education (later renamed Editorial Projects in Education). It was during his work with EPE that Gwaltney came to realize that "higher education in general would benefit from a news publication." He and other board members of EPE got together and laid out plans for a new publication. It would be called The Chronicle of Higher Education. Today, the weekly newspaper is considered the Wall Street Journal of higher education. Gwaltney remains executive editor and chairman of the board, and continues to edit and monitor the paper's production from his home office. Gwaltney left the Johns Hopkins Magazine in good hands. Ron Wolk, editor from 1959 until 1962, went on to win a Sibley Award in 1961. To date, Johns Hopkins Magazine has won nine Sibley awards over the years--more than any other college or university magazine in the nation. The magazine born in a greenhouse is still shooting for the moon--and beyond.